Translators: Asha Puri with Manu Bhatnagar, Publishers: The Mud Village Society 24, Chitra Vihar (FF), New Delhi 110092Price not mentioned. (PB). TO MY QUERY, which was directed to CRAterre [in 1990], when I received an answer, I had sighed with relief. My question was if I could use compressed mud block for building in the region where there is saline soil. The answer was negative. The cause of my relief was in this part of the world the “machine” – even the manually operated one – will not help to build with mud, and that there shall be little less intervention by the elite class, of architects at least, in the people’s initiative to build their own houses; perhaps temporarily for the present. For I cannot foresee what may befall upon people – peasants in future, save annihilation, at the hands of more powerful societies with weapons of market economy, information technology, mass media, intellectual property rights, etc. at their disposal. Because in the food – farming – sector already the hybrid seeds which require more and more water, chemical fertilizers and pesticides and deep ploughing mechanized farm implements have found their way in this region. It is not without causing death of the earth and indigenous seeds which helped the sustainable ecology until now. CRATerre’s answer had described that the only possible method was to build by hands and the manner, which in fact the people of the region had developed and practiced over generations. THE EARTH TOUCHES every facet of Indian life, from humble lamp burnt with vegetable oil to housing, and from ‘Chulha’ – hearth – and utensils to farm and water management. The universal building material ‘earth’ is now being termed as ‘non – conventional’, thanks to the environmental revolution which started in the modern times in the industrial civilization of the West, and is slowly being accepted by the advanced societies. ‘Building with Earth’ gives sufficient ‘scientific base’ and also ‘industrial footing’ to the subject, which the educated look for. About 300 pages of the book are abundant with tables, graphs, illustrations in diagrams, drawings, details and photographs, and cover several case studies, traditional practices, use of machines, soils and modification of soil characteristics, construction methods, binders and stabilizers, renderings and finishes with much sophistication. It is attached with bibliography, a list of organizations and new research in the field. 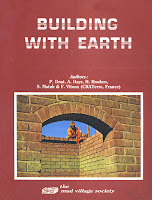 It is indeed a comprehensive treatise on building with earth and an excellent textbook. 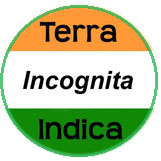 Now that this up–to–date manual on earth technology, imported from the West, is made available in India, it should give enough credibility to “earth” as a building material. The earth, not merely a matter but Mother Earth, is used by the majority of Indians to build a house. It could now safely be recognized by and introduced in the organized sector of technical education of the architects, engineers and technicians/artisans by the Indian universities, IITs (Indian Institutes of Technology), ITIs (Industrial Training Institutes), polytechnics, boards of technical education at the state and national level, Council of Architecture, Indian Institute of Architects, Institute of Engineers, SSCE and HSCE Boards, Shramik Vidyapiths and other autonomous organizations engaged in housing, education and funding etc. besides NGOs (Non-Government Organizations) active in the rural and urban areas in development work. Though earth as building material remained outside the educational curriculum in India, it was, however, given a due place in the famous “P.W.D. Handbook (1950, Rs. 7.62, First Edition 1876) of former Bombay Presidency during the British Rule. There are other building materials, namely thatch and Bamboo, which are also ignored in the technical education in India. Thatch certainly has a place in the materials, specifications and practices in the West. Bamboo grows abundantly in India. It is absent in the western textbooks because it does not grow in that region. What are the possibilities of applications of this treatise on earth in the Indian Context? Cities have their own constraints where earth to build upon and to build with is under great pressure. Nearly 50% population of Bombay (now Mumbai) lives in the slums and squatters. In these settlements, however, earth is a major component in spite of variety of rags being used. At the countryside the majority people continue to use earth in spite of urban influence to use high fossil energy consuming materials such as reinforced cement concrete (RCC). The Indian countryside is full of diversity of land characteristics, climate, languages, food, dresses… which is beyond generalizations. It is obvious that soils and their characteristics change with localities. Various regions have their indigenous ways of using earth for building: plains of river Ganga, Jamuna, Brahmaputra etc. (flood-prone); desert areas of Gujarat – Rajasthan (scanty rain fall – now earthquake-prone); Deccan plateau (now earthquake-prone); tropical rain forest region of coast (cyclone-prone) and many other regions. One must not expect to find all the answers to all the conditions in this book. The professionals, therefore, could trust a little more the traditions – the traditions of the so-called illiterates, uneducated, and ignorant rural folks, their wisdom and skills – and do not depend fully on such manuals while practicing at local levels. Ironically folks from various parts of the country also could be found in the cities and towns after the massive migration that has been taking place during the last few decades. What is more? A major part of the labour force – unskilled, semi-skilled and skilled – in the building construction industry could be found in the slums and squatters, for example, in Bombay (now Mumbai). As has been said earlier, the book has educative value as a textbook. Traditionally, however, science and technology were available free of cost to the people and learning has been experiential and holistic. It was not the department of education, but the people had autonomy in education. So also Epics and Puranas, which were passed on by mnemonic method from generation to generation over centuries and have become intrinsic part of life of people. When teaching became authoritative and totalitarian, Sant Jnaneshwar (saint-poet of Maharashtra state) had to ask a buffalo to recite Vedas to put the pundits in their right context. Sant Tukaram (saint-poet of Maharashtra state) challenged, “Only we understand meaning of Vedas; other carry burden on their heads.” We need to understand the mindset of the people. Today with printing technology and mass production, the education has gone into the safe custody of the privileged few and has become inaccessible to the ‘masses’. The publisher’s note mentions that the book shall be available at 50% discount to the students of architecture and engineering. But the price is not mentioned – a popular gimmick. Taking into account the aids, supports and the price of the forest at the cost of people (not merely price of paper) the book should not cost more than Rupees 30/- to 40/- to make it truly global! Besides, the publicity given in the book to the commercially available machinery in the West should further bring down the price. Taking into account the huge demand for housing the price could be further slashed down to make it truly utilitarian book. Better still if the book is translated in the regional languages. All those who advocate sustainability, alternative – appropriate – intermediate etc. technologies should begin to apply energy costs rather than the currency costs while pricing any work – a book or a mud house. We cannot, perhaps, ignore more than two hundred million people are living below poverty line, and as many are without shelter in India. In Indian sense, environmental concerns encompass matter, mind and Soul. You may order the book from the Publishers. Please note the price is not mentioned.